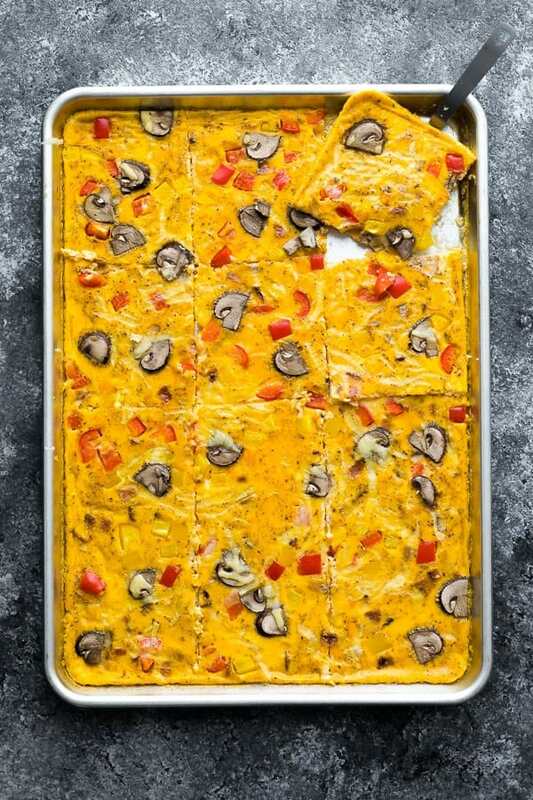 Sheet pan eggs are a big batch breakfast recipe that is perfect for serving a crowd, or batch prepping breakfasts on Meal Prep Sunday! This post was sponsored by Egg Farmers Of Canada and I was compensated monetarily for my time. Thank you for supporting the brands that I love! Do you prefer a sweet or savoury breakfast? Well, today, I’m all about the savoury breakfasts in celebration of World Egg Day (a global celebration dedicated to eggs)! Canadian egg farmers take the greatest pride in caring for their hens and the high quality eggs that they produce. Did you know that Canadian eggs are produced in every province and territory? 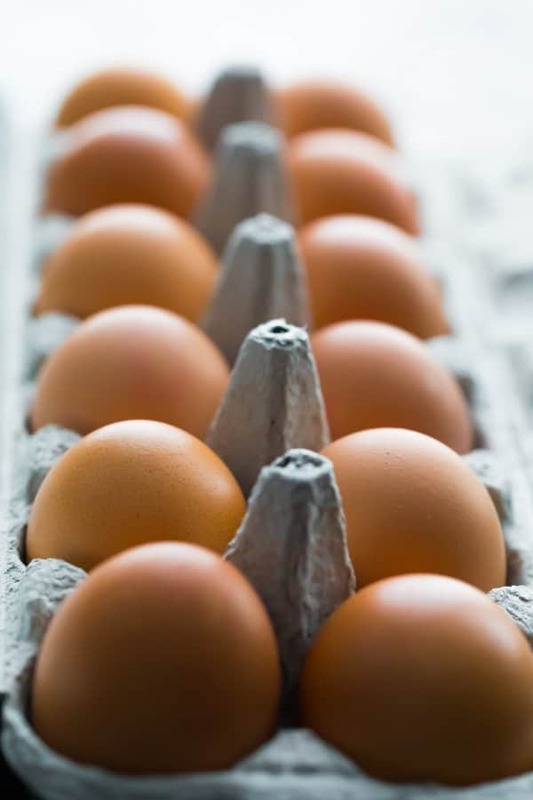 This means that no matter where you purchase your eggs, they are from a local farmer. Love that! they are really simple to prep and very hands off! 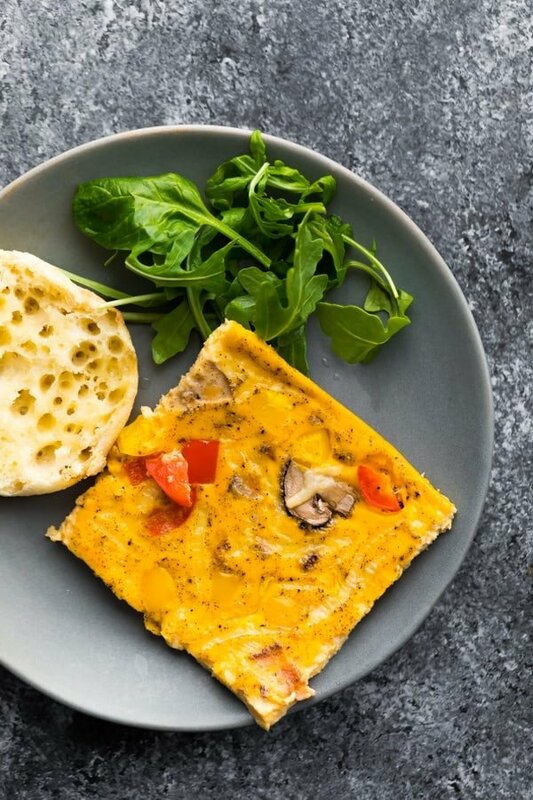 Think of this egg recipe as kind of like an omelette, but for a crowd! Cooking up these eggs in a sheet pan means you don’t have to hang out over the stove top…it’s so efficient and allows you to focus on other things while they bake. Stir in some milk, salt & pepper. 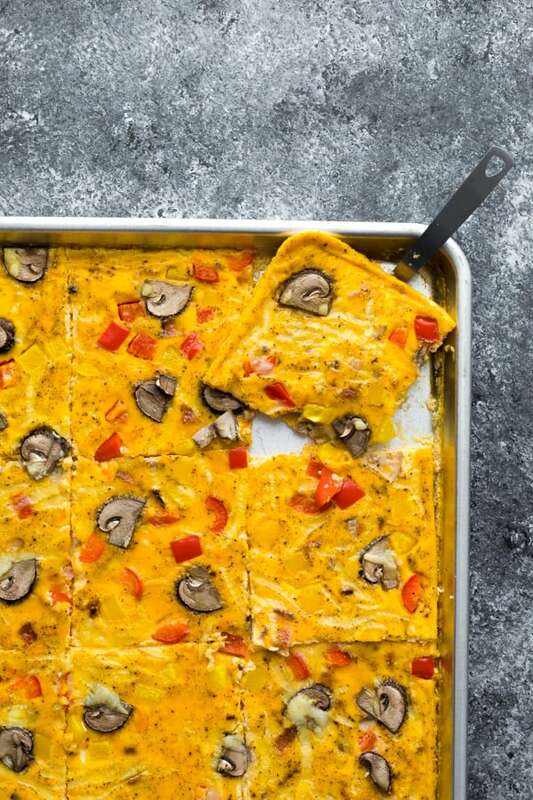 Pour the eggs into the sheet pan, then sprinkle with any veggies, bacon, or cheese you’d like to add. Allow to cool slightly before serving or portioning out! 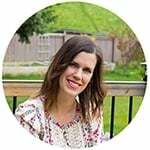 Eggs are one of my favourite meal prep breakfasts, because they are full of protein to fill you up and fuel your body. Not only that, but eggs contain a ton of vitamins and minerals including iron, vitamins A, D, E and B12 and folate. 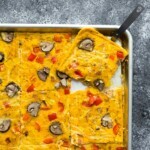 Can I freeze leftover sheet pan eggs? Yes! I would wrap in plastic wrap and place in a larger storage container, and you can freeze for up to 3 months. Thaw completely, then heat in the microwave before enjoying. Can I bake this in a 9 x 13 inch baking dish instead? Sure, but you’re going to need to cut the recipe in half. Grease the pan well, and bake at 375°F for 20-25 min, or until the eggs no longer jiggle. What add-ins can I use? We enjoyed our sheet pan eggs with some cooked & chopped bacon, bell peppers, mushrooms and cheese, but you can use almost any vegetable that is finely chopped including: spinach, kale, broccoli, cauliflower (or cauliflower rice), onion, sun dried tomatoes, even corn. I do caution you not to go too crazy with the veggies as they do release liquid and you don’t want your eggs to get too liquidy. I recommend these glass bento boxes to store in the fridge for meal prep; I portion out with some fruit and extra bacon for an easy breakfast! Grease a good quality 12X17 inch (and at least 1 inch deep) baking pan with 1 tablespoon of olive oil. Don't forget the sides of the pan. 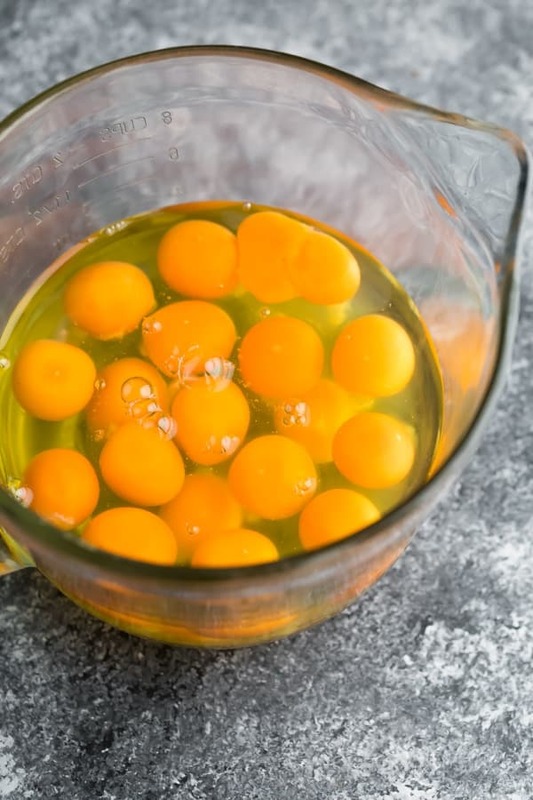 In a large bowl, beat the eggs together. Stir in the eggs, salt and pepper and beat until well combined. Pour egg mixture into the prepared baking sheet. Sprinkle the vegetables, bacon and cheese over top evenly. *Carefully* place the tray in the oven. Bake for 10 minutes, then carefully rotate the pan. Bake for another 10 minutes (total cook time of 20 minutes), or until the eggs no longer jiggle. Remove from oven and allow to cool slightly, before running a knife along the edges of the pan and gently scooping the eggs out of the pan. Fridge- I recommend portioning out into meal prep containers with some extra bacon and fresh fruit for up to 4 days. Freezer- wrap individual slices in plastic, then place in a large sealed storage container. Freeze for up to 3 months. Thaw completely before heating in the microwave and enjoying. Sheet pan egg recipe looks great! I cannot wait to try it. Thank you. I hope you enjoy it, Kym! What’s the best way to heat the eggs back up after they have been in the fridge? Hi Whitney! I just popped mine in the microwave with some folded paper towel underneath. You can also reheat in a frying pan!